Why does the following code return no objects in the array. Here is a screen shot from within Xcode at the pList editor. They seem the same Jim ! The problem stems from creating the pList directly in Xcode. 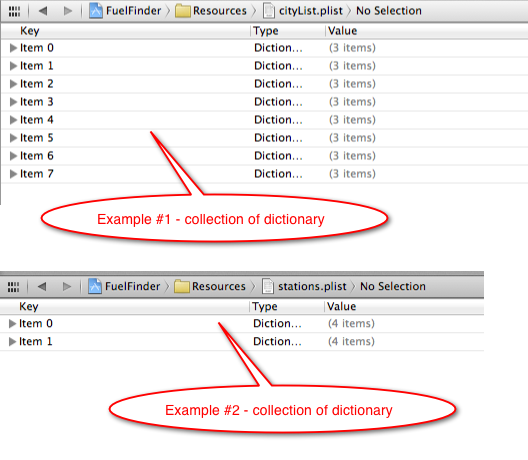 Here we can see a text view of the two versions of the file, subtle but critical difference. There seems to be an extra tag here ! So when we try and initialise the NSMutableArray with the contents of the file it is only finding dictionary entries, therefore fails and we end up with an empty array. So a word to the wise, when you are creating pList files directly via xCode, make sure they are set up correctly.